We caught up with the owner of Forty Five Degrees and Blu Martini to learn a little bit of history on these hot hangouts. What is the best selling item on your menu? FortyFive Roll or Blu Martini Roll: Crab Cream cheese, spicy sauce, avocado, cucumber, wrapped in soy paper. All of our sushi is great. We really have well rounded menu items. What is your most popular martini? Depends on the season. We have over 30 martinis to choose from on our list. Note: The Carmel Candy Apple Martini is a great fall choice! You’ve created a unique ambiance in each location-what’s the story behind your choices? I just wanted a modern interior and something different for our city. 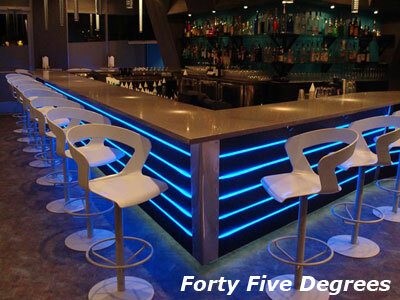 Holidays are just around the corner-how can people plan to gather at Forty Five Degrees or Blu Martini to celebrate with their friends and colleagues? People can call the restaurants individually Blu Martini 317.566.8650 Forty Five Degrees 317.634.4545 or they can email me at bill@blumartini.net. We host many of these parties and it’s not too early to book them now. No party is too big or too small for us and we always can fit a party within a budget. What other events are coming up? 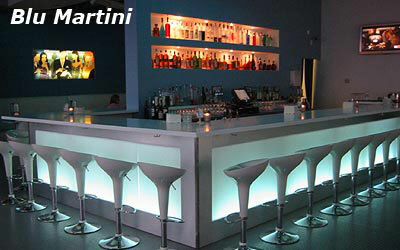 Please see the calendar pages of both websites: www.blumartini.net and www.fortyfiveindy.com. We have so much going on and our calendars are always updated. What type of texts can people in your Text Club expect to get from you? Info about events and specials. Note: Not in their text club yet? Join now! Only your standard text messaging rates apply. We have great drink specials almost every night of the week. We welcome large parties and groups, and we serve great food including sushi.